Quick. Easy. Delicious. Got my husband to eat broccoli. 'Nuff said! In a wok or large sauté pan, add 1 inch (2.5 cm) of water and bring to a boil. Add the broccoli and cover to steam for 3 minutes. The broccoli should be bright green, crisp tender and you should be able to pierce the stem with a fork. Drain. Everyone in my family would love this. Oh no! 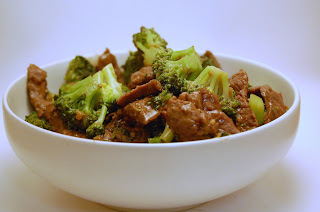 Now I have a huge craving for beef with broccoli! This looks sooo good!